↑ ၁.၀ ၁.၁ ၁.၂ ၁.၃ ၁.၄ van Leeuwen, F. (November 2007). "Validation of the new Hipparcos reduction". Astronomy and Astrophysics 474 (2): 653–664. doi:10.1051/0004-6361:20078357. Bibcode: 2007A&A...474..653V. ↑ ၂.၀ ၂.၁ ၂.၂ ၂.၃ HR 6134, database entry, The Bright Star Catalogue, 5th Revised Ed. (Preliminary Version), D. Hoffleit and W. H. Warren, Jr., Centre de Données astronomiques de Strasbourg ID . Accessed on line September 07, 2012. ↑ ၃.၀ ၃.၁ ၃.၂ ၃.၃ "Multi-component absorption lines in the HST spectra of α Scorpii B" (October 2007). 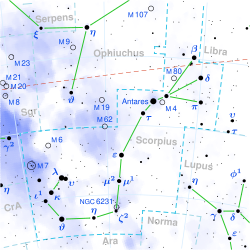 Astronomy and Astrophysics 474 (1): 229–237. doi:10.1051/0004-6361:20077308. Bibcode: 2007A&A...474..229B. ↑ "Variability in red supergiant stars: pulsations, long secondary periods and convection noise" (2006). Monthly Notices of the Royal Astronomical Society 372 (4): 1721–1734. doi:10.1111/j.1365-2966.2006.10973.x. ISSN 0035-8711. Bibcode: 2006MNRAS.372.1721K. 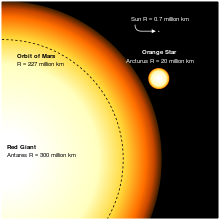 ↑ ၈.၀ ၈.၁ ၈.၂ ၈.၃ "On the absolute scale of mass-loss in red giants. II. Circumstellar absorption lines in the spectrum of alpha Sco B and mass-loss of alpha Sco A" (1978). Astronomy and Astrophysics 70: 227. Bibcode: 1978A&A....70..227K.